What’s the most beautiful U.S. coin ever made? Whenever that question arises, one of the first and most frequent answers is sure to be the Saint-Gaudens double eagle, or twenty-dollar gold piece. And those who know the subject well are almost certain to specify the “Saint” with high relief. 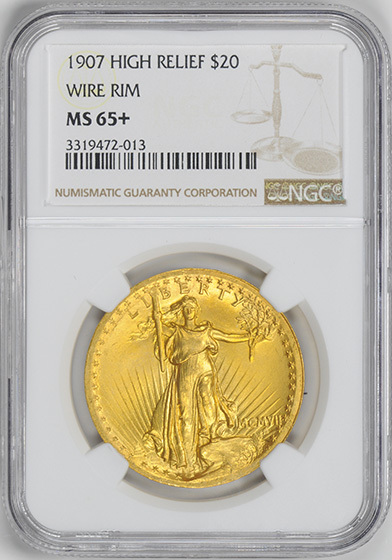 This stunning coin resulted from a truly unique relationship between two towering figures of their day: Augustus Saint-Gaudens, the most famous American sculptor at the turn of the 20th century, and Theodore Roosevelt, a U.S. president whose ardent pursuit of excellence encompassed the nation’s coinage. Saint-Gaudens accepted the challenge eagerly and began preparing dramatic new designs to replace the long-running Liberty double eagle and Coronet eagle, the two largest U.S. gold coins, both of which had carried the same basic portraits for more than half a century. He also fashioned a new one-cent design. 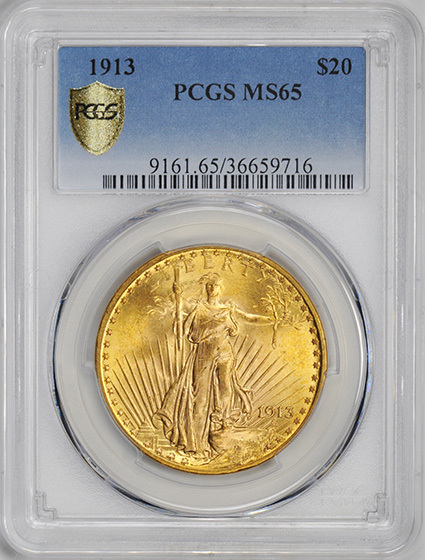 The cent never reached production, but the gold coins emerged as masterworks of numismatic art. The double eagle’s obverse features a full-length portrait of Liberty grasping a torch in her right hand and an olive branch in her left. She is shown in full stride with rays of sunlight behind her, the word LIBERTY above her and the U. S. Capitol Building to the left of her flowing gown. Encircling her are 46 stars—one for each state in the Union at that time. The designer’s monogram (ASG) appears below the date. The coin’s reverse depicts a breathtaking eagle in flight—perhaps the most spectacular likeness of the nation’s official emblem ever to grace a U. S. coin or medal. Below this magnificent bird is the sun with its rays extending upward; above it, in two semicircular tiers, are the inscriptions UNITED STATES OF AMERICA and TWENTY DOLLARS. High points to check for wear are Liberty’s breast and knee and the eagle’s wing. The artist reinforced the clean, uncluttered look of the coin by placing one other required motto, E PLURIBUS UNUM, along the edge, thereby reducing the obverse and reverse verbiage. The normal clutter was further reduced when Roosevelt and Saint-Gaudens conspired to omit the motto IN GOD WE TRUST on the first of the new double eagles. Roosevelt, a devout man, believed using the name of God on our currency was blasphemy, for there was no way of knowing for what unworthy purpose it might be used. He thought the name of God belonged in houses of worship, not in saloons, casinos and bordellos. But God-fearing members of Congress with a different viewpoint soon noticed this and mandated addition of the motto too later issues. Roosevelt and Saint-Gaudens intended the double eagle to be struck in high relief—though clearly not as high as the very first strikes—so each exquisite detail would be shown to full advantage. They encountered resistance, however, from the U. S. Mint’s chief engraver, Charles E. Barber, who considered this impractical and sought to abort the project. Saint-Gaudens died in August 1907, before production began, leaving his able assistant, Henry Hering, to carry on the running battle with Barber. The earliest production strikes were indeed made with high relief; according to Breen, they received five blows apiece from the Mint’s hydraulic press. In addition to the business strikes, there also are “probably at least eight or nine proofs,” he reported, with these having received six or seven blows apiece. Some production strikes had a wire rim, others a flat one, and all displayed the date in Roman numerals. But after turning out just 11,250 pieces, Mint technicians substituted new dies with modified, lower relief. Barber’s objections based on practicality had prevailed. In yet another concession to commercial expediency and public unfamiliarity, the Mint replaced the Roman numerals with Arabic ones on all further coinage. 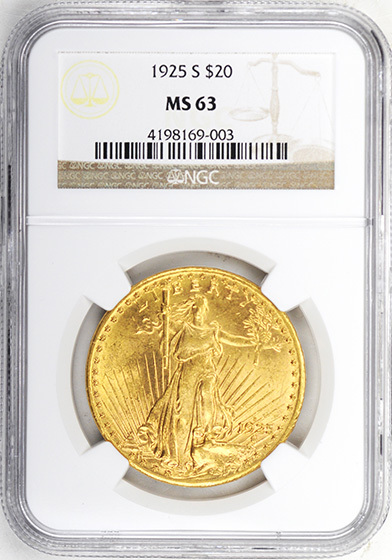 The high relief edition of Saint-Gaudens’ double eagle became an instant collectible, pieces bringing as much as $30 within weeks of their issue. Philadelphia coin dealer Henry Chapman seems to have been the principal supplier to numismatists, as he was with so many desirable products of the Philadelphia Mint. 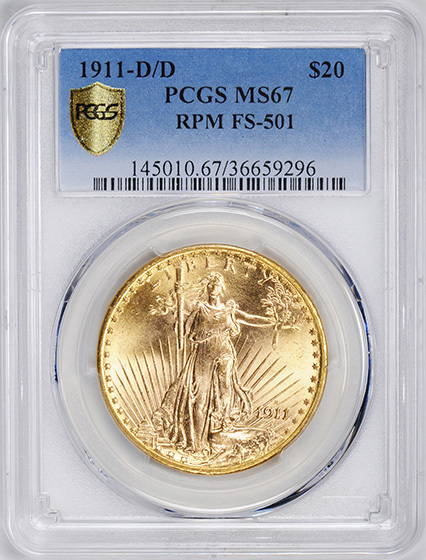 Breen pronounced the high relief double eagle to have been “the finest American coin design ever to reach circulation.” Collectors certainly agree, for today the high-relief is one of the most sought-after coins in numismatics. The actor Adolphe Menjou had a particular penchant for the coin; he accumulated 250 pieces before his hoard was dispersed in the 1970s. Thanks to the high-relief and ultra-high- relief examples, the full realization of Saint-Gaudens’ numismatic artistry lives on for all to admire. United States coinage has never been more beautiful than it was in the early years of the 20th century. The Buffalo nickel . . . the Mercury dime . . . the Standing Liberty quarter . . . the Walking Liberty half dollar—these were among the aesthetically stunning coins that made their first appearance and circulated side by side during that period. Fittingly, however, the centerpiece of this “golden age” wasn’t a nickel or silver coin, but one made out of gold. 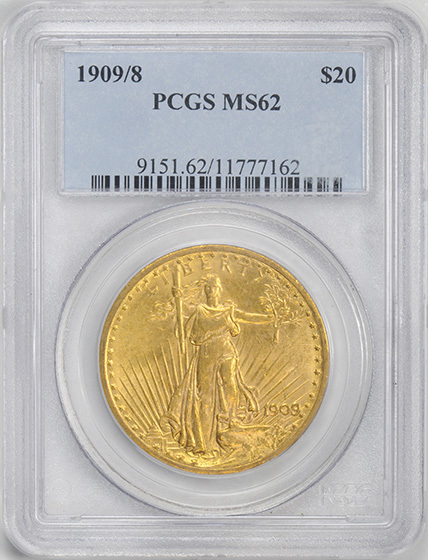 The Saint-Gaudens double eagle, or $20 gold piece, stands above the rest as the single most magnificent coin of this—or any—era in U.S. history. As the 1900s dawned, Augustus Saint-Gaudens was a towering figure in the sphere of American fine arts. Widely acclaimed as the nation’s preeminent sculptor, he was also a man of eloquence and influence who dominated the art world of his day not only by example but also through the exercise of power and persuasion. His brilliance and renown brought him to the attention of President Theodore Roosevelt, and the two men developed a warm relationship that was at once both personal and professional. In 1905, Saint-Gaudens designed a handsome inaugural medal for the president. Pleased and impressed, Roosevelt then invited him to fashion prospective new designs for the two largest U.S. gold coins, the double eagle and eagle, and also for a one-cent piece (which never reached production). Saint-Gaudens welcomed the challenge and plunged into the project with all his prodigious energy and skill. Both men admired the high relief coinage of ancient Greece, and both agreed that U.S. gold coins patterned after that model would be a spectacular achievement. They would also stand in stark contrast to the two undistinguished-looking coins that were being replaced, the Liberty double eagle and the Coronet eagle, both of which had their roots in the first half of the 19th century. Although his health was deteriorating as the project went along, Saint-Gaudens created superb designs for both gold coins. The double eagle, especially, is a masterpiece. Its obverse features a full-length portrait of Liberty with a torch in her right hand and an olive branch in her left. She is shown in full stride with rays of sunlight behind her and the U.S. Capitol Building to the left of her flowing gown. Encircling her are 46 stars—one for each state in the Union at that time. The coin’s reverse depicts a breathtaking eagle in flight, with the sun below extending its rays upward. Above the eagle, in two semicircular tiers, are the inscriptions UNITED STATES OF AMERICA and TWENTY DOLLARS. High points to check for wear are Liberty’s breast and knee and the eagle’s wing. Saint-Gaudens placed another required motto, E PLURIBUS UNUM, along the edge of the coin, thus reducing the clutter on the obverse and reverse and reinforcing their clean, open look. He and Roosevelt conspired to omit IN GOD WE TRUST from the first of the new double eagles, but God-fearing members of Congress noticed this and mandated addition of this motto on later issues, starting near the end of 1908. On pieces produced thereafter, it appears above the sun on the reverse. Roosevelt and Saint-Gaudens intended that the coin would be struck in high relief to bring out each exquisite detail. Unfortunately, though, the artist died in 1907, almost on the eve of the coin’s debut. Meanwhile, Roosevelt was preoccupied with more pressing matters of state. All this, combined with the requirements of mass-produced coinage, gave Mint Chief Engraver Charles E. Barber a chance and an excuse to reduce the coin’s relief. High-speed minting required this, he said—and what’s more, high-relief coins wouldn’t stack. Fortunately, the beauty of the coin remains dazzling, even in lower relief. 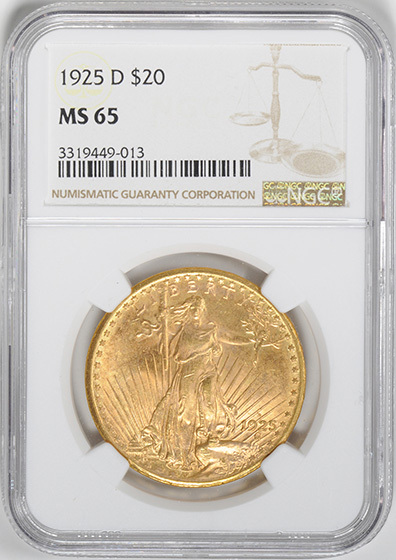 And thankfully, Saint-Gaudens’ original art was preserved in its pristine beauty through the minting of small numbers of extremely high-relief patterns and high-relief business strikes in 1907—or rather MCMVII, for the date was shown on these coins in Roman numerals. The first production pieces were made with high relief. But after striking just 11,250, Mint officials substituted new dies with the modified, lower relief, and these remained in use through the end of the series. As if to underscore the shift from the classical to the commercial, the Mint used Arabic numbers in dating all reduced-relief double eagles. “Saints” were minted each year from 1907 through 1916. A three-year hiatus followed, after which the coins were struck yearly from 1920 through 1933. The branch mints in Denver and San Francisco augmented the main Philadelphia Mint production, but not in every year. Mint marks appear above the date the designer’s initials (ASG) below. 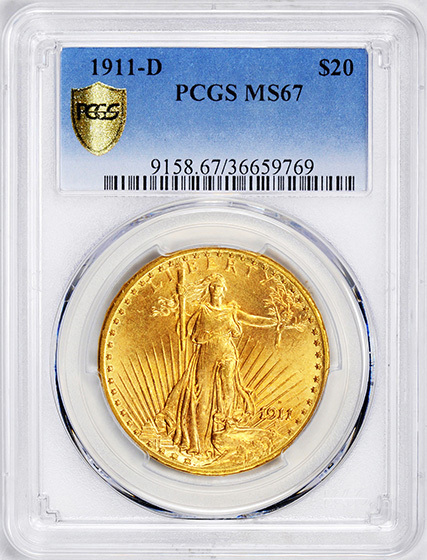 From 1929 onward, newly minted examples were held almost entirely as part of the nation’s gold reserves, with few being released into circulation. Almost all of these were melted (along with many earlier double eagles) following the gold recall order signed in 1933 by another President Roosevelt—Theodore’s cousin, Franklin. As a result, double eagles dated 1929 through 1932 are exceedingly rare today. The Mint produced nearly half a million pieces dated 1933, but the government maintains that these were never released, and thus it is illegal to own them. Only a single piece currently resides in private hands, while two examples have been preserved within the Smithsonian Institution, to which they were transmitted in 1934. That was the end of regular-issue U. S. gold coinage. 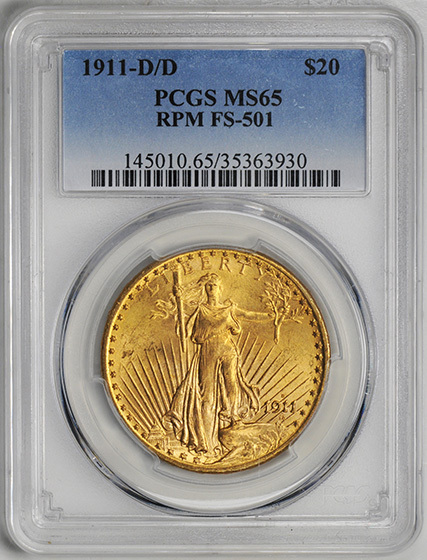 Mintages were generally modest, but heavy melting, not low mintage, was primarily responsible for creation of the major rarities, including the 1927-D, 1920-S, 1921, 1930-S and 1932. The survival of many of these dates is predominately due to the large quantity of gold coins held in Swiss and French bank vaults. Since the ‘50s, tens of thousands of “Saints” have found their way back to their country of origin and into collectors’ hands. Proofs are very rare as only 687 were offered for sale from 1908 through 1915. They were made with a flat matte finish except for 1909 and 1910 when they were made with a more brilliant Roman or satin finish. 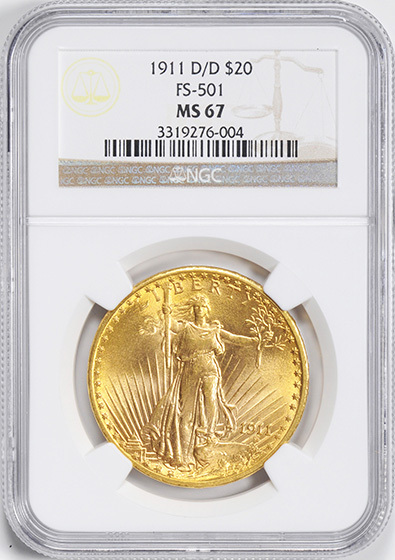 This large gold coin is actively sought by a myriad of collectors: from bullion hoarders to type collectors to those challenged by the awesome (and expensive) undertaking of assembling a complete date and mintmark set. 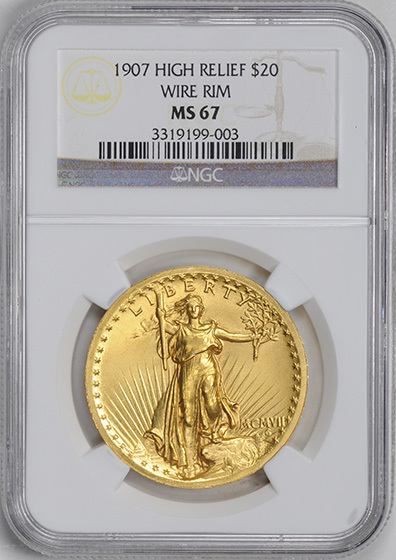 In 1986, the U.S. Treasury paid the “Saint” the highest compliment by placing its obverse design on the American Eagle gold bullion coins, where it has remained ever since. GEM SURFACES. ONLY 2 COINS GRADED HIGHER. FS-501. VERY SCARCE DOUBLE MINTMARK VARIETY. D OVER D. FS-501. GEM LUSTEROUS SPECIMEN. GEM SATIN LUSTER. SOLE HIGHEST GRADED D OVER D BY PCGS. GEM SATIN LUSTER. 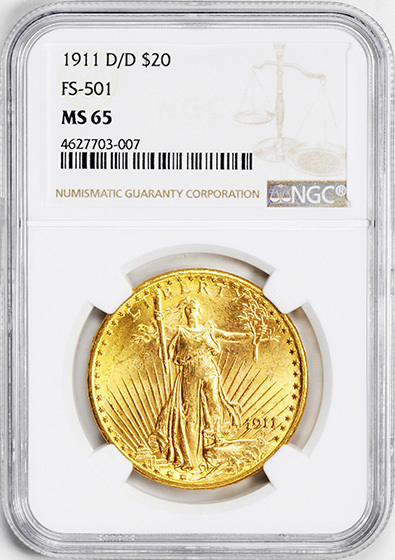 JUST 2 COINS: A MS67* AND MS67+ GRADED HIGHER. GEM SURFACES. TIED FOR HIGHEST GRADE AT PCGS. A RARE DATE GEM. ONLY 1 GRADED HIGHER AT NGC. CHOICE LUSTEROUS KEY DATE ST. GAUDENS $20 GOLD.